Little Feat is an American rock band formed by singer-songwriter, lead vocalist and guitarist Lowell George and keyboardist Bill Payne in 1969 in Los Angeles. George disbanded the group due to creative differences in 1979, shortly before his death. Surviving members reformed Little Feat in 1987, remaining intermittently active to the present. George continued to produce the albums, but his songwriting contribution diminished as the group moved into jazz fusion, a style in which he had little interest. In August 1977, Little Feat recorded a live album from gigs at the Rainbow Theatre in London and Lisner Auditorium in Washington, D.C. Waiting for Columbus is considered by many rock music critics to be one of the best live albums of all time, despite the fact that significant portions of George's vocals and slide work were over-dubbed later in the studio. It was released in 1978, by which time it had become apparent that Lowell George's interest in the band was waning, as was his health. While touring in support of his solo album in June 1979, at the age of 34, George collapsed and died in his hotel room in Arlington, Virginia. An autopsy determined the cause of death was a heart attack. Barrere then released two solo albums, 1983's On My Own Two Feet (Mirage) and 1984's Real Lies (Atlantic). Richie Hayward was the drummer on Robert Plant's 1985 funk and new wave flavoured Shaken 'n' Stirred (Es Paranza). Payne has always been a popular and busy session musician, as well as a songwriter, and during the band's first hiatus performed on a variety of albums by many famous musicians including J. J. Cale, the Doobie Brothers, Emmylou Harris, Pink Floyd, Bob Seger, Linda Ronstadt, Jackson Browne, James Taylor, Bonnie Raitt, and Stevie Nicks. He was a guest performer on Raitt's Sweet Forgiveness in 1977, which featured his composition "Takin' My Time." In 1986 Richie Hayward, Paul Barrere and Bill Payne were invited to play on Blue Slipper, the 1987 debut album by Helen Watson. They subsequently appeared on her second album The Weather Inside. The surviving former members of Little Feat then reformed in 1987 when Barrere, Clayton, Gradney, Hayward and Payne added songwriter/vocalist/guitarist Craig Fuller, formerly from the band Pure Prairie League, and Fred Tackett on guitar, mandolin and trumpet. The band admired Fuller's previous work and were impressed when he toured with them in 1978 as part of the Fuller/Kaz band. They didn't require an audition, having played with him on tour, and thus, the new Little Feat lineup was formed. The initial release by the new lineup, Let It Roll, was a tremendous success and Fuller's presence proved to be a major factor. His strong vocals and songwriting abilities were showcased, co-writing 8 of the 10 songs and handling a large share of lead vocals. The first single, "Hate to Lose Your Lovin'", earned the band their first No. 1 hit on the Mainstream Rock Tracks chart. All Music Guide critic Stephen Erlewine stated " What's surprising about Let It Roll is not just that it works, but that it works smashingly." The LP garnered Feat a certified gold record status on February 14, 1989. On the heels of this success, previous Feat releases experienced a sudden surge in sales. The February 10, 1978 live release Waiting for Columbus went certified platinum on November 8, 1989. Dixie Chicken, originally released on January 25, 1973, went certified gold also on November 8, 1989. The band received more exposure than ever, including an appearance on Saturday Night Live. Concerts were booked nationally and Little Feat played enthusiastic, sold-out shows. Barrere, Payne and company were pleased by the audience reaction; not only were they able to put over the Feat classics, but the new music proved to be artistically and commercially successful. 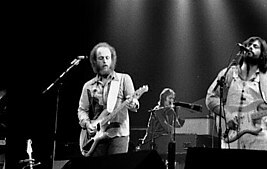 While some Little Feat diehards initially had difficulty accepting the band without Lowell George, the success of Little Feat with Fuller could not be disputed. The band made a comeback that introduced a whole new generation to Little Feat and reignited their past, even though their original creative genius (George) was no longer around. The follow-up album, Representing the Mambo, released in 1990 proved to be the group's last album for Warner Bros., who were uncomfortable with the album's more jazzy leanings. The third and final album by this lineup, Shake Me Up (1991), was released on Morgan Creek as was the soundtrack of the 1992 film White Sands, which contained one song by Little Feat called Quicksand and Lies, but this label folded soon afterwards and Little Feat moved from one label to another until the establishment of Hot Tomato Records in 2002. Shaun's first album with the group was Ain't Had Enough Fun. As well as having material specifically written for her, for increasing fan draw attracted to her hard-edged powerhouse voice, further albums Under the Radar and Chinese Work Songs saw Murphy become an integral part of the group sharing lead vocals and writing with Payne and Barrere. Her rendition of Bob Dylan's "It Takes a Lot to Laugh" was first recorded in studio on Chinese Work Songs, and became a favorite in live appearances with Murphy as lead singer prior to her departure in 2009. After recording five studio albums and performing over 1,400 concerts with the band, Murphy's position was made redundant, and the group pared down to a six-piece collective entity. Shaun would subsequently form the Shaun Murphy Band, with a specific blues-oriented niche. As of May 2011, Shaun had released two albums and returned to take her place with the Silver Bullet Band in the 2011 tour of Bob Seger, in addition to many scheduled live appearances with the Shaun Murphy Band, one of which was to release a third album and DVD, Live in Detroit. In August 2009, Richie Hayward announced that he had recently been diagnosed with a severe liver disease and would be away from work indefinitely. A benefit concert was organized  and a website created where fans unable to attend could donate toward his treatment costs. Little Feat announced that their drum technician Gabe Ford would take his place. In 1994 Paul Barrère was diagnosed with Hepatitis C and in 2013 took a leave of absence from touring with Little Feat to combat the disease and to remain close to his health providers. He later performed a few one-off gigs with Fred Tackett as an acoustic duo and recorded collaborations with longtime friend Roger Cole. In August 2015 it was announced that he was suffering from liver cancer. In 2014 the band Leftover Salmon announced that Bill Payne had joined with them as a permanent member. He left them in 2015 to take up a permanent post in The Doobie Brothers' touring band: this restricts his ability to perform longer tours with Little Feat. The full band performs around 10 dates per year. Barrère, Tackett, Gradney and Ford play Little Feat material as a four-piece called Funky Feat. Some of the prominent musicians and bands to play and record the music of Little Feat include Phish,  The Black Crowes, The Byrds, The Bridge, Garth Brooks, Jackson Browne, Bob Dylan, Steve Earle, The Flying Burrito Brothers, Emmylou Harris, Taylor Hicks, Ron Holloway, Keisuke Kuwata, Nicolette Larson, Nazareth, Robert Palmer, The Radiators, Bonnie Raitt, Linda Ronstadt, John Sebastian, Richard Shindell, Carly Simon, Mick Taylor, Van Halen, Joe Walsh, Bob Weir, Phil Lesh, Sam Bush, Coco Montoya, Vince Herman, Inara George, Stephen Bruton, Widespread Panic, Warren Haynes and Gov't Mule, Blackberry Smoke, Jimmy Buffett, Anders Osborne and Gregg Allman. 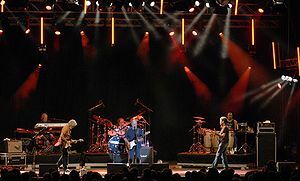 In 2008, Little Feat reached their 20th anniversary as a once-again active band, and with just one lineup change since 1988. Jimmy Buffett has been an enthusiastic booster of the band for many years and his private record label was partnered with Feat's Hot Tomato Records to produce the CD Join the Band. Released in mid-August 2008, the album features collaborations with Buffett, Dave Matthews, Emmylou Harris, Bob Seger, Béla Fleck, Brooks & Dunn, Chris Robinson (Black Crowes), Vince Gill, Mike Gordon (Phish), and Inara George. Little Feat: Skin It Back - The Rockpalast Collection (2009, DVD) – at the Grugahalle, Essen in 1977, just before the recording album Waiting For Columbus. Includes almost 30 minutes of alternative rehearsal versions including material that did not make it into the final show. ^ "The Durable Led Zeppelin | Music News". Rolling Stone. March 13, 1975. Retrieved April 19, 2014. ^ "Little Feat Live at Auditorium Theatre on 1975-10-18 : Free Download & Streaming : Internet Archive". Archive.org. Retrieved April 19, 2014. ^ "INTERVIEW WITH ROY ESTRADA, 17.11.02". Idiotbastard.com. Retrieved December 14, 2017. ^ "Kathy Dalton - Amazing". Discogs. Retrieved December 14, 2017. ^ "Little Feat - Biography & History - AllMusic". AllMusic. Retrieved December 14, 2017. ^ Liner notes to 2002 CD re-release of Waiting for Columbus. ^ Steve Keiss. "Featbase Setlists". Featbase.net. Retrieved September 20, 2011. ^ "News". Little Feat. Retrieved September 20, 2011. ^ "Pacific Disturbance". Pacific Disturbance. Archived from the original on October 8, 2011. Retrieved September 20, 2011. ^ "October 31, 2010 Setlist :: Phish.net". Retrieved June 26, 2012.